Price Drop! Was: $119.95 Now: $109.96. For a limited time only, while stocks last. When you need to, you need to go... Ditch the dreaded hole digging with this handy portable toilet. 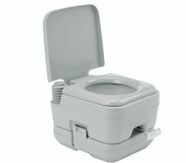 This 10L adult size portable toilet is made of high-density polyethylene, so it is light but sturdy. Completely self-contained, the portable restroom does not require external water or power connection to operate. A 12L fresh water tank to provide up to 50 flushes, and a 10L waste holding tank that can be easily detached and emptied. Double sealed drain valve to prevent leakage and odour. This portable potty is ideal for camping, off roading, hunting, fishing, boating, back packing etc., it can also be used as an emergency toilet for schools, hospitals, and aged care. This portable toilet will surely be helpful in difficult situations when nature calls! Can Be Used in Any Season Including Winter.